These are the special gifts that made this Christmas Day one to remember for North East families. More than 20 babies came into the world at hospitals across the region yesterday. Christmas dinners and present opening mornings went out the window as planned festivities were interrupted by the new and very welcome arrivals. At the Royal Victoria Infirmary in Newcastle most of the Christmas Day babies came early. Charlotte and Kevin Fletcher, from Benton, North Tyneside, are now planning to eat the Turkey they had bought on Boxing Day instead after their new son, who does not yet have a name, made an appearance. The baby, who weighs just over 7lbs will be a younger brother to their two-year-old, Ada. Full-time-mum Charlotte, 30, said: “I was due on Friday and then I woke up at 3am thinking I was going to cook the Christmas dinner and I went into labour. I had bought everything so it’s all in the fridge waiting. We will just have it on Boxing Day. Victoria and Jon Cheetham, from Lemington, Newcastle had a quiet family Christmas planned for themselves and four-year-old son Kass. But baby Cole, who had been due on Sunday, had other ideas and chose to come into the world at 9.55am yesterday. Victoria, 33, who works at the Connexions youth service, said: “He was due on the twenty ninth, but the little tinker decided to come early, weighing in at 8lbs 1oz. He obviously wanted to meet his big brother. And telephone engineer Jon, 28, added: “We just didn’t expect it to happen on Christmas Day at all. But it is really special. 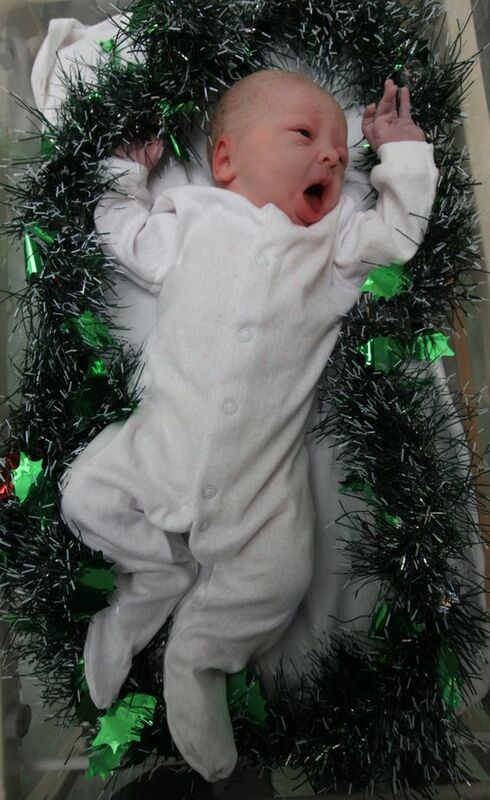 Leanne Robson, from Walker, Newcastle, also went into labour early on Christmas morning. And 8lb 5oz Lexi-Mae was photographed by our photographer when she was just 35 minutes old. By midday six babies had been born at the RVI, four at the Queen Elizabeth Hospital in Gateshead, two at Wansbeck General Hospital, one at Hexham two at South Tyneside and four at the University Hospital of North Durham. The first baby to arrive on Christmas Day came at just before 1am at Durham.